I love Valentine’s day. 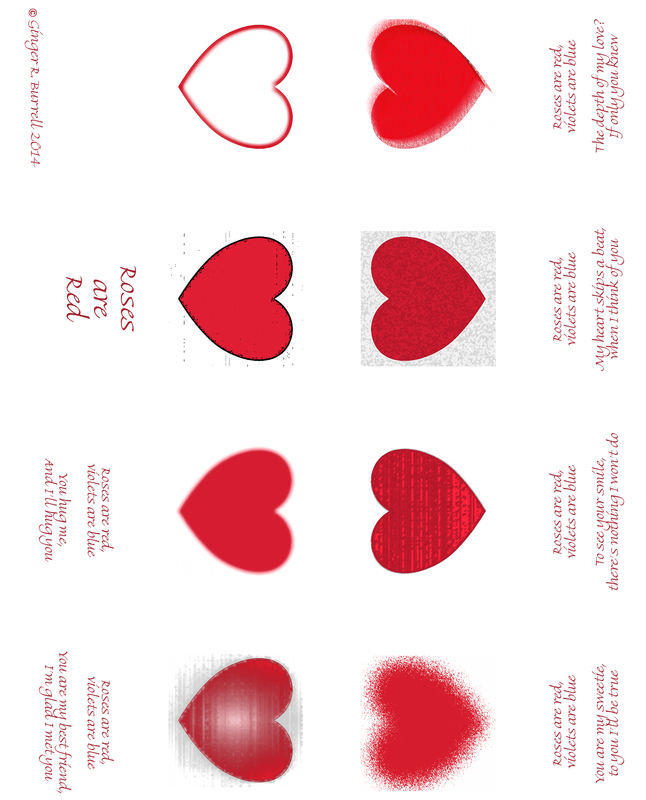 I know many people scoff and I certainly would be the first to argue that you should be telling your loved ones a lot more often that they are special to you… That being said, I can’t resist sentiment, red hearts or glitter! Last year my Valentine’s gift to you was the instructions for a book with a Polymer Clay Mosaic cover. 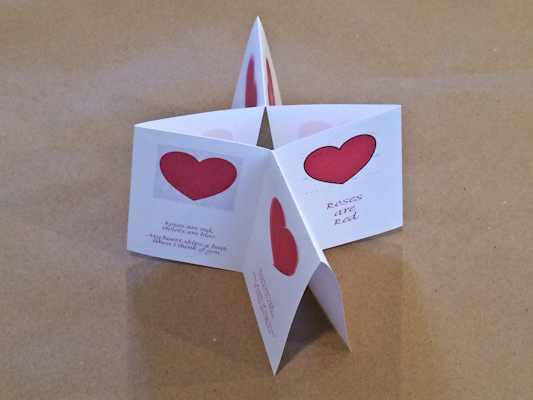 This year I thought I’d make you a Flutter Book (also called an X Book, Maze Book, or a Cut and Fold Book). Here is the file, print as many as you’d like. Click the link to get the PDF. To assemble your book, first print on the highest print quality that your printer will produce. 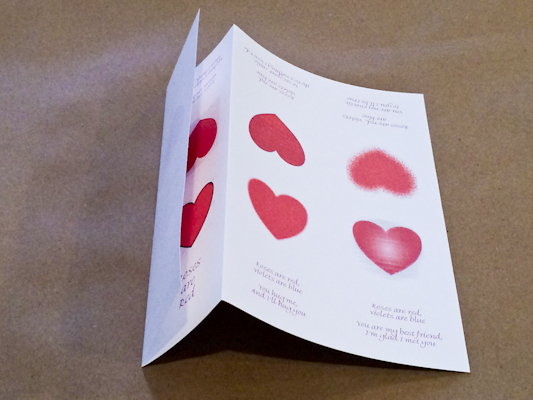 If you’d like a paper that feels velvety and more special than plain copy paper, try Hammermill Color Copy. 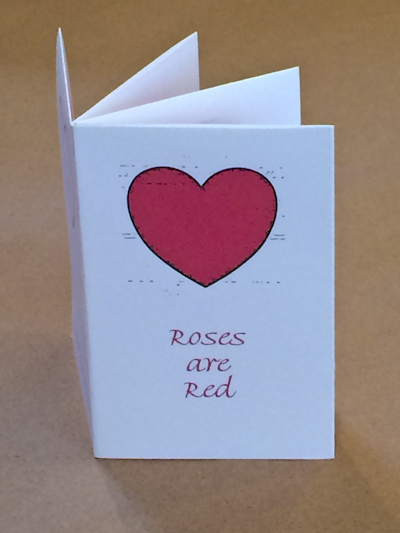 (Trust me, you’ll fall in love with this silky paper.) Be careful when you print – my print dialogue kept defaulting to “fit to page” which changes the dimensions and will make your book turn out catty-wampus. 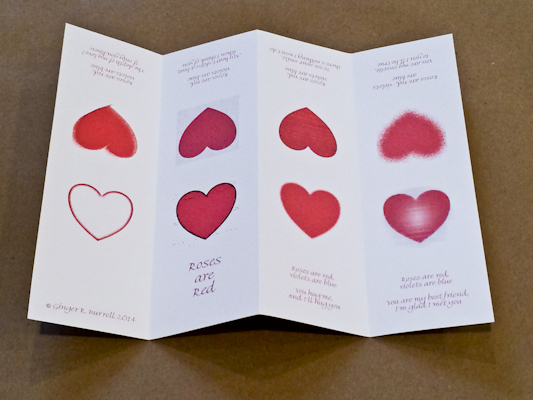 It is designed to have the hearts and poems centered on each page. 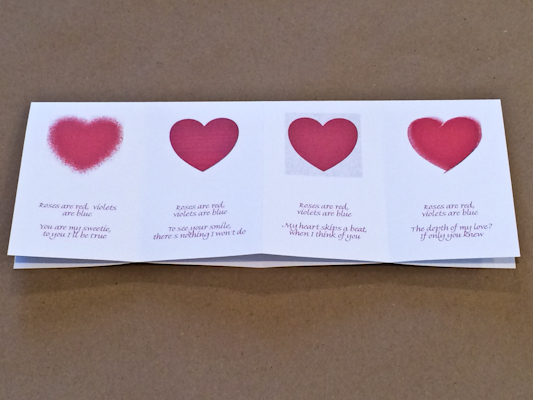 After printing your page, fold the paper in half (with the images on the outside). 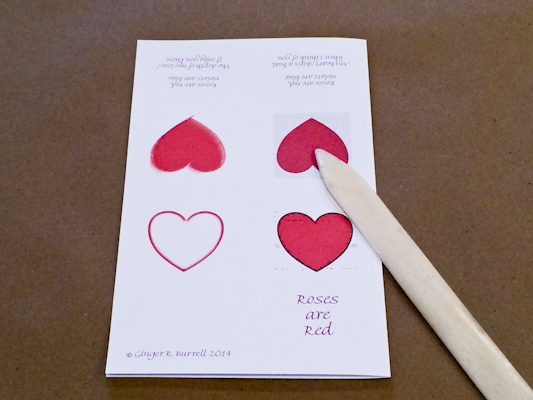 Use a bone folder to make the crease sharp. Now fold your paper in half lengthwise and unfold. Again, crease carefully. 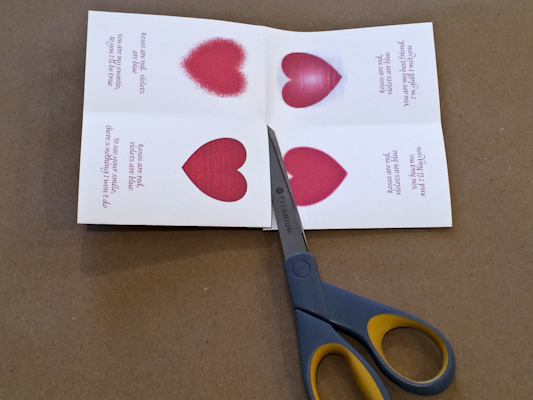 Re-fold your paper in half, with the images on the outside, and cut with scissors, very carefully, from the top of the fold, down to the horizontal fold. Keeping your book folded, use the outer two folded halves and push inward. The cut halves will fold the other way, so you have an X. Lay flat and press, starting with the back page. Voila! This entry was posted in Artists' Books, Handmade Books, Instructions and tagged Artists's Book, cut and fold book, flutter book, Ginger Burrell, handmade book instructions, Valentine's, www.gingerburrell.com, x book. Bookmark the permalink. Thanks for sharing such a sweet book.